Antelope Canyon is in northern Arizona, not far from the Utah-Arizona border. 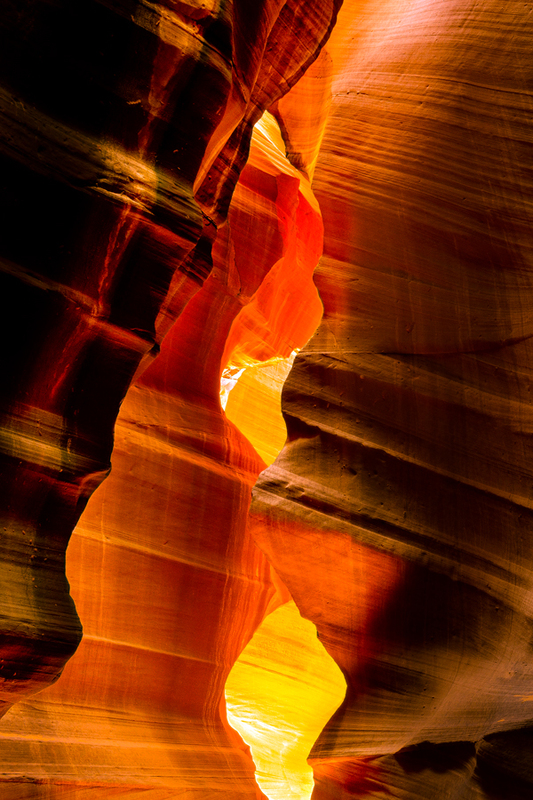 The slot canyons of Antelope Canyon present all sorts of challenges, especially because it’s so dark in the underground canyons. Long exposures, and a lot of patience, are de rigueur in this environment. On the day I took this photo, I was accompanied by a Navajo Indian guide who knew the canyons well. He helped with crowd control (there were lots of tourists) and he got me into the right places. When I saw this particular location, I could see what looked like a flame reaching toward the sky. To get the most from this, I chose a composition that emphasized how a flame looks to most people. The orange of the flame, and its surrounding glow, is really set off because of the darker elements around it.